Be the first to share your favorite memory, photo or story of Ada. This memorial page is dedicated for family, friends and future generations to celebrate the life of their loved one. Mrs. Ada Lucille Halcomb, 94 of Berea and formerly of Mt. Vernon, died Monday, October 8, 2018 at the Berea Health & Rehabilitation Center. She was born in Falmouth, KY on February 29, 1924 the daughter of Herbert and Luanna Varner Smith. She was a retired nurse’s aide for Rockcastle Hospital. 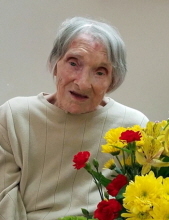 She was of the Holiness Faith and enjoyed reading, sketching, and helping people. She is survived by her children, Norma Proctor and Janet Grider, both of Berea; two grandchildren, Sheila Jones of Richmond and Kelly North of Cincinnati; and two great grandchildren, Justin Jones of Richmond and Cody Jones of Berea. She was preceded in death by her husband, Ed Halcomb; a daughter, Edwina North; a brother, Leroy Smith; and a sister, Ina Varner. To plant a tree in memory of Ada Lucille Halcomb, please visit our Tribute Store. "Email Address" would like to share the life celebration of Ada Lucille Halcomb. Click on the "link" to go to share a favorite memory or leave a condolence message for the family.